Wow! I never realized how difficult it can be finding something worthwhile to write about without a specific narrative available to guide me. With the resumption of "the letters" being a full 8 months away and my pathetic attempt at keeping this blog alive until then, I am finding it increasingly difficult to find pertinent and unique items to write about. American soldiers during the Second World War would frequently play the national pastime during down times in the war...between battles, air sorties, etc... It didn't matter if they were stationed in the European theater or the Pacific theater...American boys loved their baseball. Likewise, during the Civil War, americans boys had begun their love affair with the game that was relatively new on the sports scene. It was an easy game to set up and play, especially in the early days of baseball when there were no gloves or other equipment. All you needed was a ball, a sturdy stick or bat, a few sacks or pieces of rock or wood to use for bases and a bunch of guys willing to play. So, throughout american conflict history, our soldiers have loved playing the national sport...providing stress relief from the battlefield. So, my story starts in England in 1998 when I was assigned to work a program for my company. My family came with me and we lived in southern England for 3 years. During that time, my wife made many friends and essentially we all all became part of the local life...shopping, dining, school life, etc...blending in with our English friends. In our small village of Stubbington, my wife's regular hairdresser, Kim, loved to talk about her family and particularly her father, who loved Americans based on his interaction with them during World War II. Her father was a teenage boy who lived in Lincolnshire, a county north of London. The boy lived in a village close to one of the airfields used by the USAA 8th Air Force, and spent a lot of his time "hanging out" with the GIs. Kim was kind enough to share her family stories and one of them caught my attention. I thought it was absolutely touching and something that would wonderful to convey to others. Fortunately...we have the internet...and it is a effective way to get information out into the public domain. At long last, one baseball bat!!! In 1944 on a Lincolnshire airfield a squadron of American bomber pilots arrived. They had their baseball, and the English pilots had their cricket. One day the Americans decided it would fun to make the cricket bat disappear. 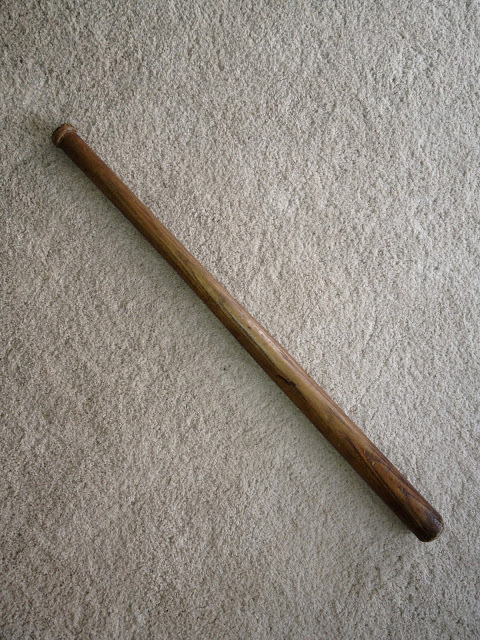 The English retaliated likewise, and the Americans baseball bat disappeared as well. The young lad was her father. Her father always cherished the bat and the memories that it brought back to him of a time when life was uncertain...and a bunch of American pilots entered his world. he always had an affection for America after the war and his trophy bat reminded him of an exciting earlier time in his life.